Artistic Wire, Copper Wire, Non-tarnish silver, 28 Ga, 15 yd spool. 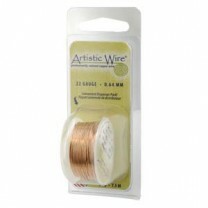 Artistic Wire, Copper Wire, Bare Copper, 28 Ga, 15 yd spool. Bare Copper do not have a tarnish-resistant coating so they will naturally oxidize and darken with time to provide a vintage look. Artistic Wire, Copper Wire, Gunmetal / Antique Brass, 28 Ga, 15 yd spool. 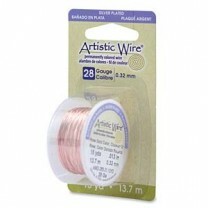 Artistic Wire, Copper Wire, Rose Gold, 28 Ga, 15 yd spool. Artistic Wire, Copper Wire, Chartreuse, 28 Ga, 15 yd spool. 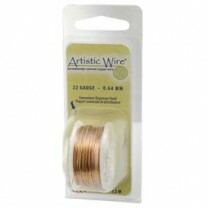 Artistic Wire, Copper Wire, Natural, 28 Ga, 15 yd spool. 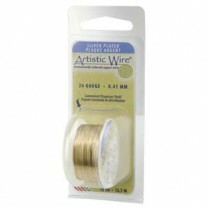 Artistic Wire, Copper Wire, Gold, 28 Ga, 15 yd spool.